Recently, I’ve received my haul from Roseannebeauty.com. 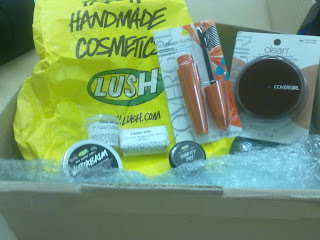 Yeah, all my favourite LUSH and COVERGIRL (not all)products from Aussie have arrived. Kind of regret when I didn’t buy Lush’s Honey I Washed The Kids and Porridge Soap Bar! 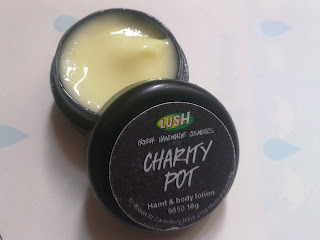 Here, let me present my LUSH&COVERGIRL haul from roseannebeauty.com! Looks rather yellowish- something like Vaseline’s. 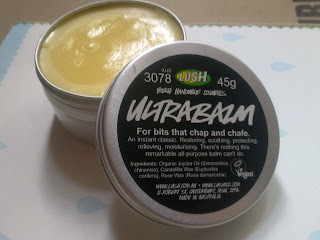 I didn’t quite like Vaseline’s , thus giving a try on the Ultrabalm, which is totally different. 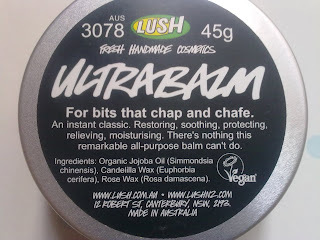 It contains organice jojoba oil(seen it rarely in Singapore), Cadelilla Wax and Rose Wax. In short, I can say that this is truly a product I’m looking for- with organic properties that moisturizes and protect my hands. It also has a nice aroma, as depicted like IKEA scented candles! This was ordered for a good friend of mine. The aroma of Ylang Ylang came out even before I open the sample (with her permission, of course!). Just a sneak-peak of the colour and texture above, with permission of my good friend to take a picture of the lil’ sample. It is a hand and body lotion; I bet the aroma would still linger even after my friend washed the lotion away after she applied! Carolyn ordered this after reading some reviews online and my recommendation. 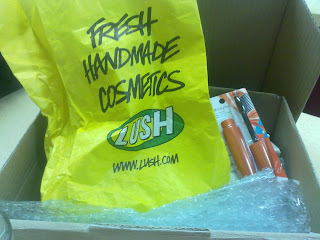 I wasn’t a fan of MASCARAS, but more into Lush, Makeup and SkinCare products. Something I must admit that Maybelline has the best drugstore mascaras in Singapore, but the range SG have is really narrow. 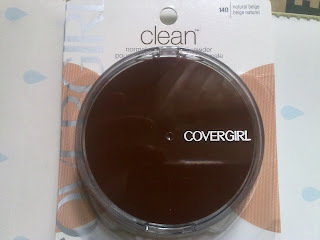 I’ll put up a review after she have tried this! A big thank-you to Roseanne for the mailorder! Carolyn and I liked the items a lot:] For those who haven’t give a try on Roseannebeauty.com’s mailorder, go ahead and try loads of makeup products that are not sold in Singapore. 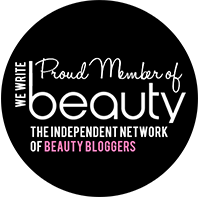 Aussie definitely have a wider range and a huge variety of makeup and Lush, prices wise is slightly costly. Overall, I think that it is worth it as She(Roseanne) took extra time and effort to find the items I wanted despite her hectic schoolwork and the speed she processed my order- Very Fast. 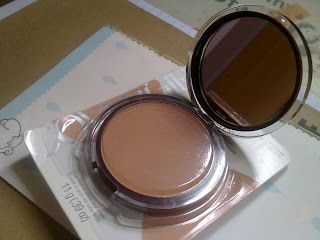 I liked Australis’ foundation and eyeshadows, they’re affordable and sufficient for everyday use. (I got my another friend in Aussie to bring back Australis to me when she comes to Singapore for a holiday.) She’s really nice to include 2 samples of Lush- Miranda Soap Bar and Herbalism Cleanser. A HUGE THUMBS-UP FOR ROSEANNEBEAUTY’S MAILORDER AND THE LIL’ SWEET LETTER SHE HAS WRITTENJ I’m definitely going to order again, and this time, surely not wanting to miss my Honey I Washed The Kids and Porridge Soap Bar!